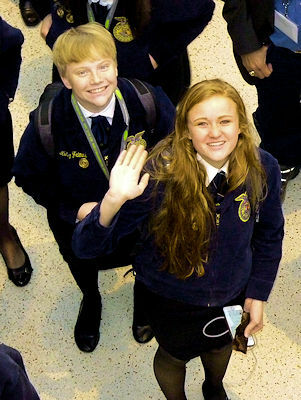 The 91st National FFA Convention & Expo held in late October in Indianapolis drew a record 69,944 attendees. We were there in the thick of things, enjoying all the sights and excitement. Thank you to everyone who stopped by our booth to greet our team or to learn more about how AgEdNet.com can provide curriculum solutions for your agriculture classroom. Your enthusiasm gives us that extra push to go back home even more committed to agriculture education. Editor's note: This content is no longer available. Now that's a timely topic! STEWART-PETERSON and AGEDNET.COM are registered trademarks of Stewart-Peterson Inc.
Photo credits: AgEdNet.com staff photo by Nancy Crombie.